Like most Labrador Retrievers I am not fond of cats and I really do not like Bobcats. 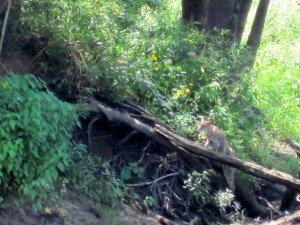 Bo and I and our clients had a Bobcat join us for lunch this week while fly fishing on the Little Red River. (Click on the photo below for a close-up look.) The Bobcat was a little too curious for me and after a bit I gave him a good growl and snarl and he took off. 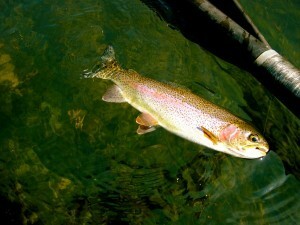 The weather has really been nice and the fly fishing has really turned on as you can see from the photo here of a beautiful fat rainbow next to our drift boat oar. The fly fishing this fall should be super and we are booking a lot of trips so give us a call and come enjoy the wildlife on the river as well as the fly fishing. Hopefully Bo will stick to fly fishing and leave the Bobcats to me!